Use Doc-To-Help along with Microsoft® Word to produce Online Help, Web, mobile, eBook, or print-based deliverables. Used by content developers, technical writers, HR managers, medical writers, and subject matter experts, Doc-To-Help is ideal for users who want to create and manage content in a familiar chapter-based Word environment. Create, customize and publish web and print-based Employee Handbooks and Medical Policy and Procedure Manuals with our professionally pre-written documents, included free with Doc-To-Help. 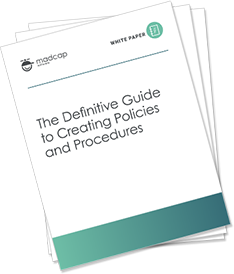 The professional pre-written manuals included with MadCap Doc-To-Help are rich with content, and include everything you need to customize important documents to fit your organization. Doc-To-Help makes it easy to import or convert existing content including Microsoft® Word and RoboHelp® projects. Import: Don't waste time with copy and paste. Doc-To-Help will import the Word-based manuals you already have and typically be ready to produce any of its outputs in minutes. Convert: You can also convert RoboHelp® projects, HTML files, HTML Help projects, and WinHelp projects. Choose from a list of professionally designed, built-in themes and interface languages or use Doc-To-Help’s visual theme designer to create new themes that match your web site or application look and feel. Conditional tags allow you to map any type of content to a specific output. For example, you may want to include a video for online output and replace it with a static image for manuals. This feature is also useful for creating student/teacher or internal/external versions of your deliverables. Doc-To-Help also includes automatic conditional content features. Print-based cross-references become links in online outputs, for example. This just scratches the surface. Conditional content technology is the secret sauce that will save you tons of time! 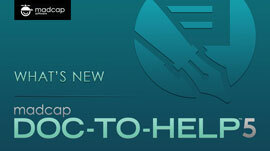 Doc-To-Help gives you technology to help manage content and workflow. Choose between Doc-To-Help’s own source control technology, Microsoft® SharePoint® or Microsoft® Team Foundation Server® for check in/out features, version history, and review workflows. Doc-To-Help makes it easy to create topics, Table of Contents, breadcrumbs and more. Looking to Move Beyond Microsoft® Word? Use MadCap Flare for Advanced XML-based Authoring, Publishing and Content Management. topic-based authoring and single-source publishing solution.